One of the old houses that remind visitors of Papan's rich past. 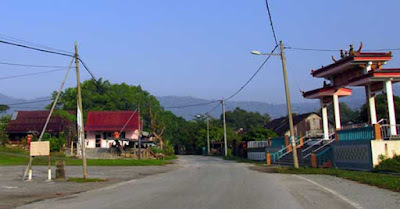 Located about 17km from Ipoh off the Ipoh Lumut highway, about three kilometres from Pusing, Papan used to be a bustling town in the late 1800s. It is believed that the Chinese had named it “ka-pan”, which means wooden plank. Word has it that in the past, the “cengal” hardwood that were harvested from the neighbouring jungles had to be brought to the town to be sawn into planks. Incidentally, its new name, Papan, also meant plank in Malay. However, Papan did not owe its fame to timber but rather tin, according to an elder who saw me painting this old house at the entrance to the town. He said Papan prospered during the glory years of tin mining and when the industry collapsed, the town’s relevance was reduced to only a soon-to-be-forgotten mention in the history books. During the Japanese Occupation, when Ipoh was bombed, people from the town sought refuge in Papan and its population grew. It was also during this period that Papan earned its “black area” reputation for insurgent activities against the Japanese, and later for communist activities during the Emergency. In 1984, Papan was again thrown into the limelight when its residents staged protests against the storage of radioactive waste in the hills not far from the town. On the right is the temple, behind which is the cemetary. Today, Papan is a sleepy hollow that only comes to life only during the Qing Ming Festival or Tomb Sweeping Day when families who used to live there come to the cemetery just outside town to pay their respects to their dearly departed. Many of the old buildings that lined the main street have been abandoned and are slowly inhabited by wild vegetation. There is very little visible economic activity here as most of the younger generation have moved to nearer towns in search of better prospects. 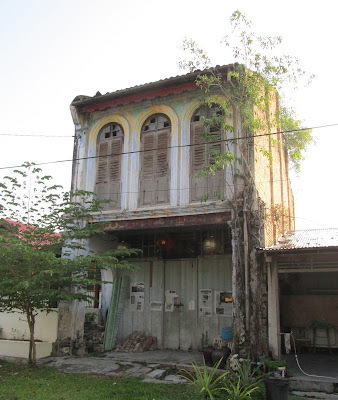 Many descendant families of the early settlers here have also moved to the new Kampung Papan Baru, located a kilometre just outside the old town where there are better facilities. If there was any sign of activity, it would be in the mornings and the area near the community hall or Balai Raya Papan, and at the two old coffeeshops along the main road. Locals meet here to have a cuppa, a meal or just to catch up. The most modern structure must be the SJKC Papan Chinese primary school which has only 80 pupils comprising 45 boys and 35 girls. This school sits by the main road next to house No. 74, a prominent landmark which once housed the clinic of Sybil Kathigasu, the Malayan-Eurasian nurse who worked with her doctor husband to support the resistance during the Japanese Occupation. Sybil received the George Medal for Gallantry, instituted by King George VI in 1940. The GM was presented to those performing acts of bravery meriting recognition by the United Kingdom and Sybil is said to be the only Malayan woman to have awarded the medal. There is a Jalan Sybil Kathigasu in Ipoh, named after Independence, to commemorate Sybil’s bravery. pasted on the doors tell a little about its history. Another historical structure in Papan is the Istana Raja Billah, a stately mansion which is also the town’s largest building in its heydays. Slowly being swallowed by tall grass but still visible from the main road, this mansion belonged to Raja Billah, a Mendailing nobleman from West Sumatera who settled in Papan with his family in the late 1800s. A merchant and tin miner, Raja Billah was also the headman for Papan at the time. Istana Raja Billah is a pale shade of itself today although it was once refurbished and turned into a museum. It was even used as location for the movie Anna and the King, according to a local who lived nearby. However, neglect in the recent years, he added, had reduced this stately edifice to its derelict self, with parts of the wooden panellings and tiles having been stolen or vandalised. Just a stone’s throw away from the Istana is the Masjid Papan. Completed in 1888, the mosque sits on land donated by Raja Billah. The structure is made of local hardwood such as cengal, merbau and damar laut. It was designed with one pyramid-shaped zinc-sheet roof sitting on top of another, separated by air vents. The entire structure rests on brick-cement piers. The mosque also did not have a tower and calls to prayer those days were made by hitting a drum known as a taboh.